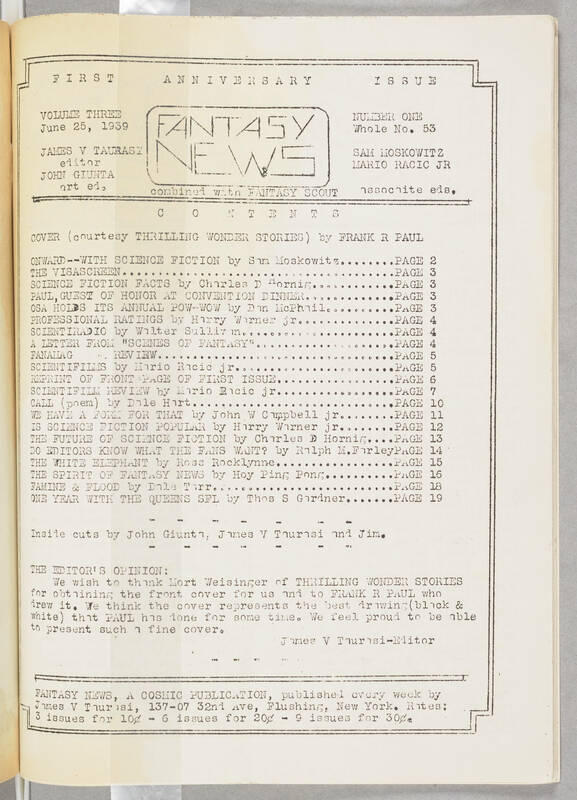 First anniversary issue FANTASY NEWS combined with FANTASY SCOUT VOLUME THREE NUMBER ONE Whole No. 53 June 25, 1939 JAMES V TAURASI, editor JOHN GUINTA, art ed. SAM MOSKOWITZ MARIO RACIC JR associate eds. CONTENTS COVER (courtesy of THRILLING WONDER STORIES) by FRANK R PAUL ONWARD--WITH SCIENCE FICTION by Sam Moskowitz ........ PAGE 2 THE VISASCREEN ........................ PAGE 3 SCIENCE FICTION FACTS by Charles D Horning ............ PAGE 3 PAUL, GUEST OF HONOR AT CONVENTION DINNER .............PAGE 3 OSA HOLDS ITS ANNUAL POW-WOW by Dan McPhail ......... PAGE 3 PROFESSIONAL RATINGS by Harry Warner jr .............. PAGE 4 SCIENTIRADIO by Walter Sullivan ............. PAGE 4 A LETTER FROM: "SCENES OF FANTASY" ............... PAGE 4 FANAMAG REVIEW ........................ PAGE 5 BCIENTIFILMS by Mario Racic jr ................ PAGE 5 REPRINT OF FRONT PAGE OF FIRST ISSUE ................. PAGE 6 SCIENTIFIC REVIEW by Mario Racic jr ................. PAGE 7 CALL (poem) by Dale Hart ............................. PAGE 10 WE HAVE A FORM FOR THAT by John W Campbell jr ........ PAGE 11 IS SCIENCE FICTION POPULAR by Harry Warner jr ........ PAGE 12 THE FUTURE OF SCIENCE FICTION by Charles D Hornig ........ PAGE 13 DO EDITORS KNOW WHAT THE FANS WANT? by Ralph M. Farley ........ PAGE 14 THE WHITE ELEPHANT by Ross Rocklynne ................. PAGE 15 THE SPIRIT OF FANTASY NEWS by Hoy Ping Pong ;.......... PAGE 16 FAMINE & FLOOD by Dale Tarr .......................... PAGE 18 ONE YEAR WITH THE QUEENS SFL by Thos S Gardner ....... PAGE 19 Inside cuts by John Giunta, James V Taurasi and Jim. THE EDITOR'S OPINION: We wish to thank Mort Weisinger of THRILLING WONDER STORIES for obtaining the front cover for us and to thank FRANK R PAUL who drew it. We think the cover represents the best drawing (black & white) that PAUL has done for some time. We feel proud to be able to present such a fine cover. James V Taurasi-Editor FANTASY NEWS, A COSMIC PUBLICATION, published every week by James V Taurasi, 137-07 32nd ave, Flushing. New York. Rates: 3 issues for 10¢ - 6 issues for 20¢ - 9 issues for 30¢ .